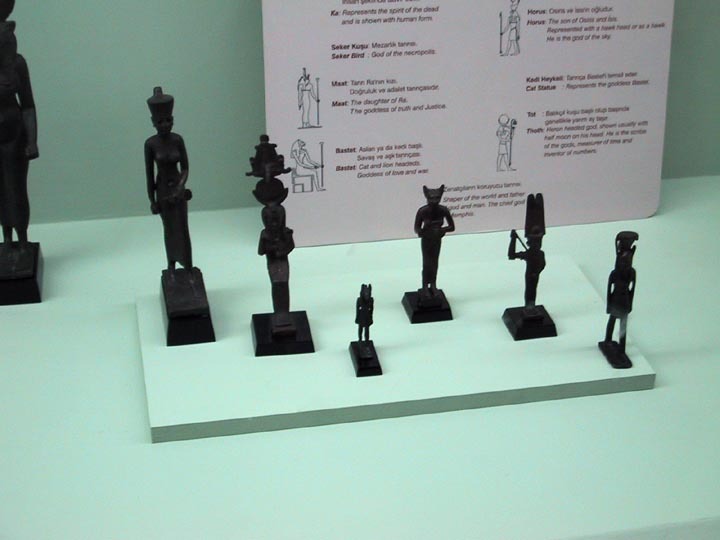 The Ancient Orient Collection in the museum contains some Egyptian and Hittite artifacts, but the early Mesopotamian collection is certainly the most stunning. 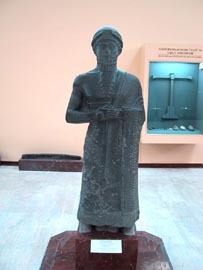 A statue from the Old Babylonian era (1894-1594 BC). 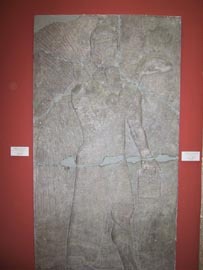 The statue was brought from Mari to Babylon as war booty in the Neo-Babylonian era. A Babylonian Genie facade - its interesting to notice that the Genie has wings, as it had more in common with angels than the "genies" of western stories. 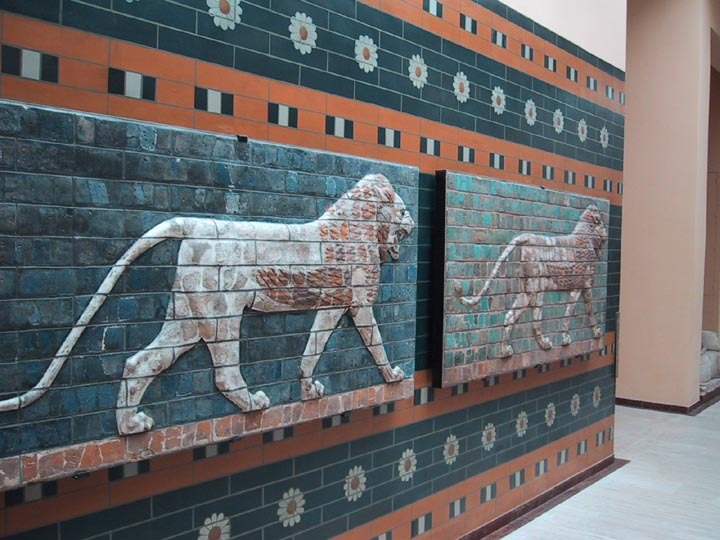 Other artifacts from Babylon include monumental glazed brick friezes from the Ishtar Gate in Babylon. 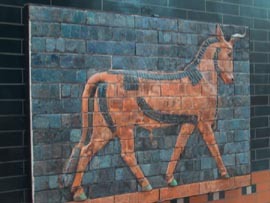 A glazed frieze of a bull from the Ishtar Gate in Babylon. 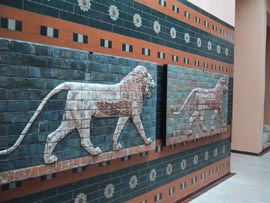 Two glazed friezes of lions taken from the Ishtar Gate in Babylon. There is also a remarkable collection of cuniform inscriptions. Cuniform is one of the oldest forms of writing ever made, some 4,000 years old! An inventory sheet in cuniform, listing the contents of a wealthy man's home. A translation plate from one form of cuniform to another, bridging over a hundred years of cuniform writing! The worlds oldest love poem, written in 2037 BC! Remember Hammurabi? It was a game based on the principles of government drafted on a plate like this in cuniform, some 3800 years ago. 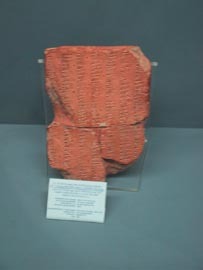 The final items of the Ancient Orient collection include the most precious of all - the Kadesh Treaty. 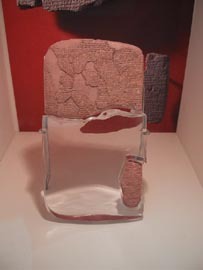 The Treaty of Kadesh concludes around 1269 BC between the Egyptian and Hittite empires, originally written on a sheet of silver. 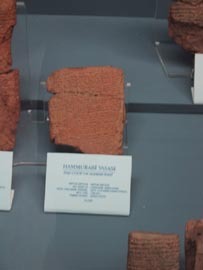 The copy in the museum is the Hittite copy. It includes many of the ideas contained in post-war treaties today, including the return of political refugees. 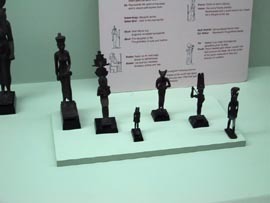 Egyptian figures in bronze. 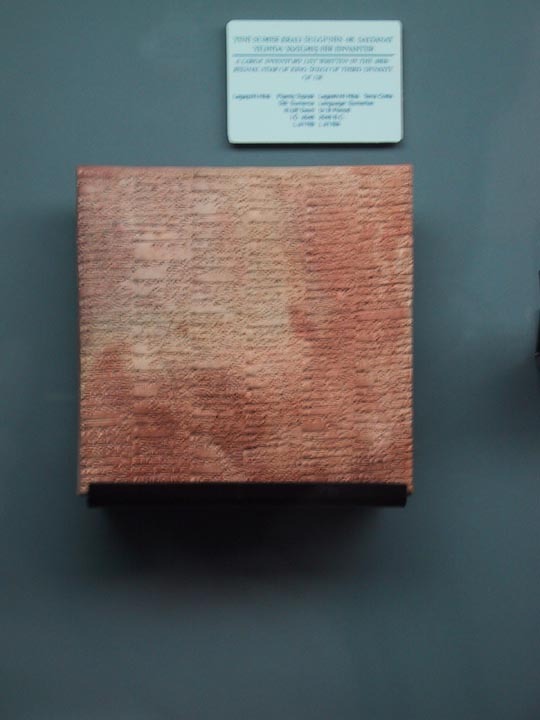 The Kadesh Treaty. 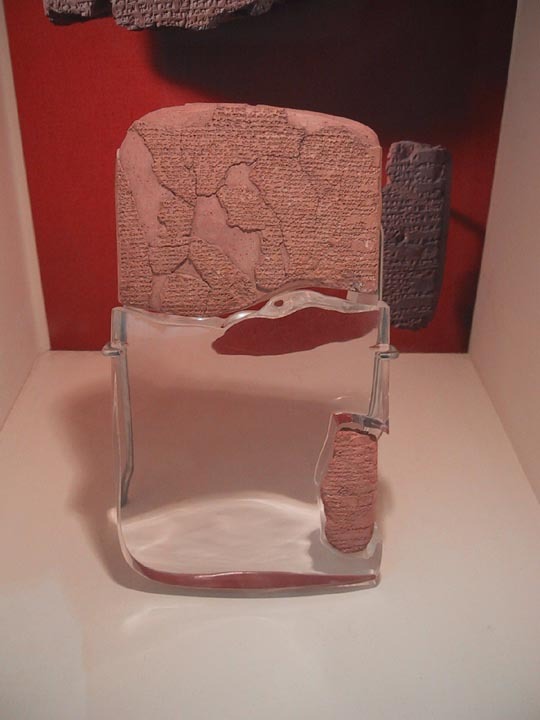 The treaty of Kadesh is the earliest known parity peace-treaty that had been concluded between the Hittite king Hattusilis III and the Egyptian pharoh Ramses II, and was written in Akkadian the international language of the day, 1269 BC. Three main versions of the treaty written in Akkadian language are known to exist. Of the treaty-documents of Kadesh discovered at the capital city of Bogazkoy-Buyukkale in 1906 by Hugo Winckler and Teodor Makridy as a result of a join expedition of Turkey and Germany, one of them presently is in Berlin at the Staatliche Museum and two of them are in the Istanbul Archaeological Museums. The Egyptian version was carved upon the walls of the temple of Amon at Karnak and of the Ramesseum edited to give greater prominence to the role of Egypt in granting peace. 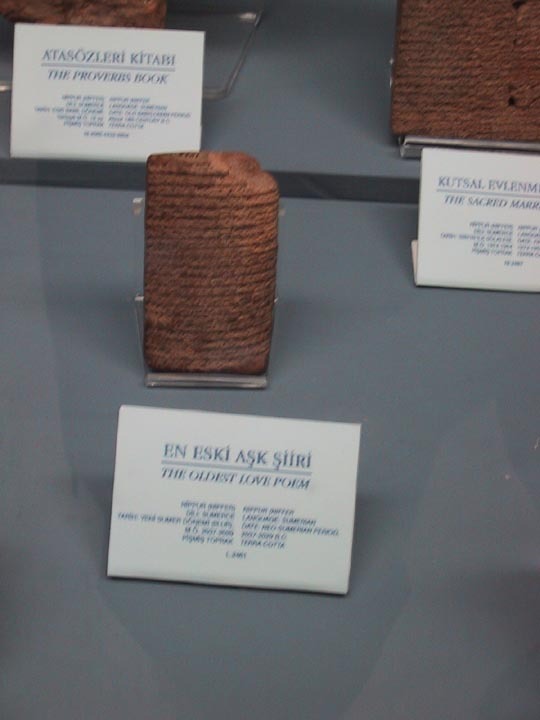 The Hittite version was much closer to the text formally agreed upon. 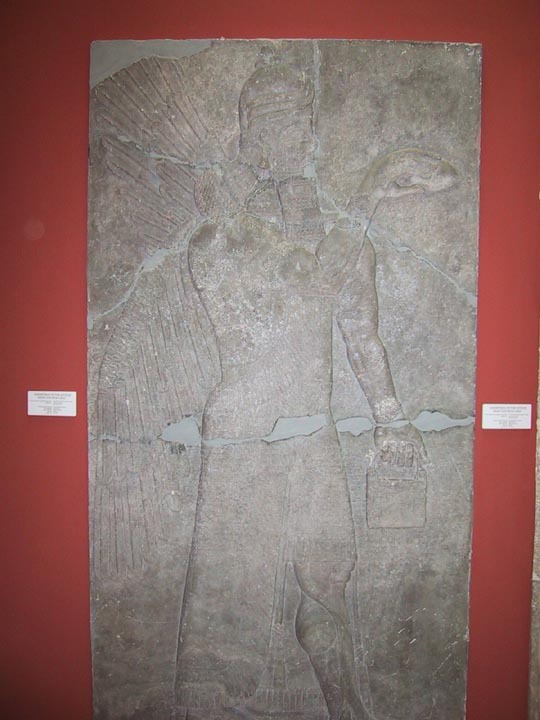 The reign of Ramses II began in hostility against the Hittite Empire. However, by this time both powers were ready to conclude a treaty, so that they might turn their attention to other problems, such as the encroachments of the "Sea Peoples" and therefore the offensive and the defensive alliance was set forth. "Treaty of Rea-Mashesha-Mai Amana the great king, the king of the land of Egypt, the valiant, with Hattusilis, the great king of the Hatti land for establishing good peace and good brotherhood worthy of great kingship forever. These are the words of Rea-Mashesha-Mai Amana: Now I have established good brotherhood (and) good peace between us forever. In order to establish good peace (and) good brotherhood in the relationship of the land of Egypt with the Hatti land forever. I speak thus: Behold, as for the relationship between the land of Egypt and the Hatti land, since eternity the god does not permit the making of hostility between them because of a treaty (valid) forever." "If an enemy from abroad comes against the land of Egypt and Rea-Mashesha-Mai Amana, the king of the land of Egypt, your brother sends to Hattusilis, the great king of the Hatti land, his brother saying: "come here to help me against him-lo Hattusilis, the king of the Hatti land shall send his footsoldiers (and) his charioteers and, shall slay my enemies."